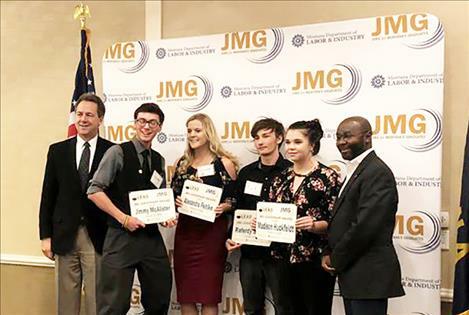 MONTANA – Governor Steve Bullock today recognized high school students for their commitment to academic excellence and leadership development at the Jobs for Montana’s Graduates 25th annual LEAD Conference. Jobs for Montana’s Graduates, a Department of Labor and Industry program dedicated to teaching students the skills they need for college or career readiness, hosts the conference each year to meet with public and private business leaders and expand their leadership skills. The 2018 LEAD Conference brought 250 students together from 34 schools across Montana to participate in leadership sessions and engage with fellow students. Students are expected to return home and share what they learned with their local JMG chapter and school. “The LEAD conference continues to teach our future high school graduates the leadership and career readiness skills they need to be successful in their next step—whether it’s continuing their education or entering the workforce,” Erica Swanson, State Director of Jobs for Montana’s Graduates, said. Governor Bullock announced four students were selected to represent Montana at the National Student Leadership Academy in Washington, D.C. in November. In addition to seeing the nation’s capital, the Montana delegates will attend leadership workshops and participate in national competitions in math, public speaking, project-based learning and employability skills.